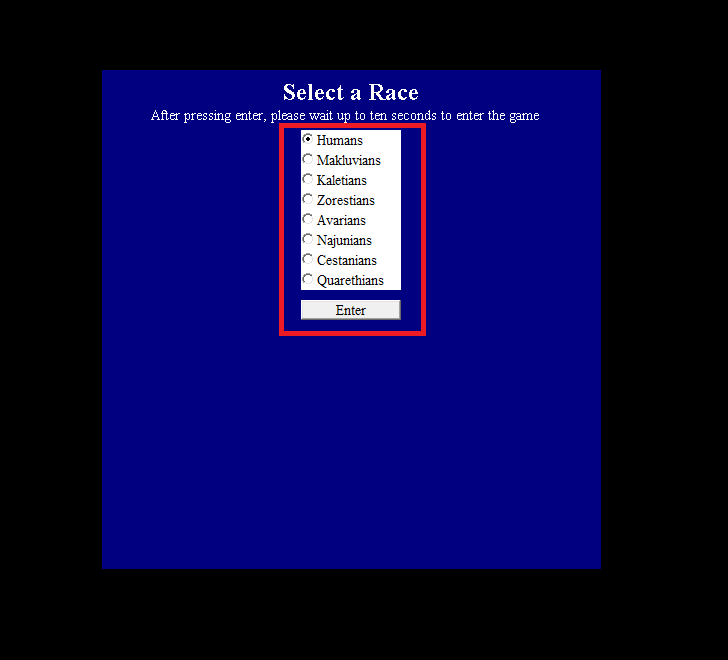 After logging in and choosing a race, you will find your fleet somewhere within the galaxy (1). Surrounding you will be many planets (2). 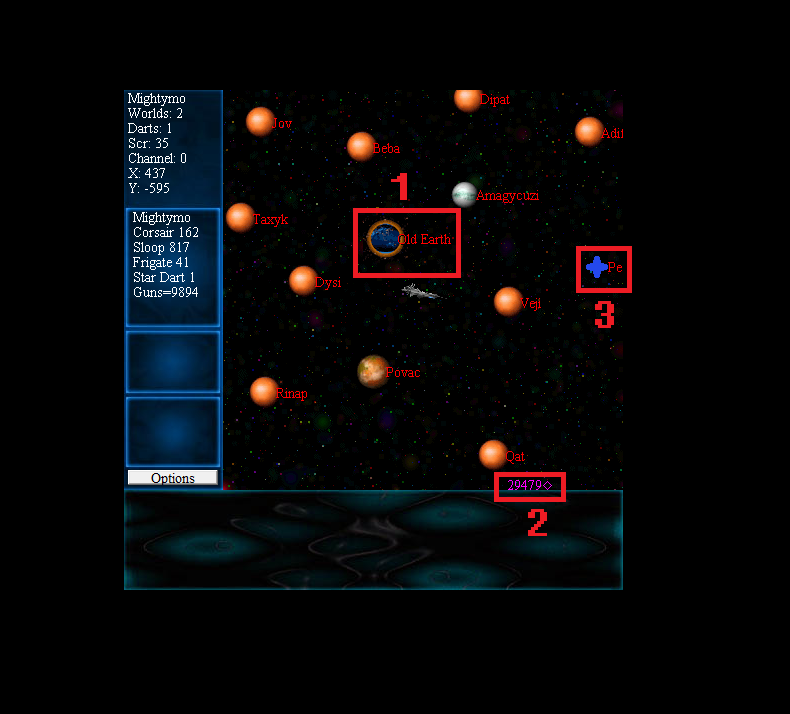 There are many types of planets, from your average ones to jungle worlds, each with special properties. Each world will be outlined below. You can see your current stats in the upper left (3). 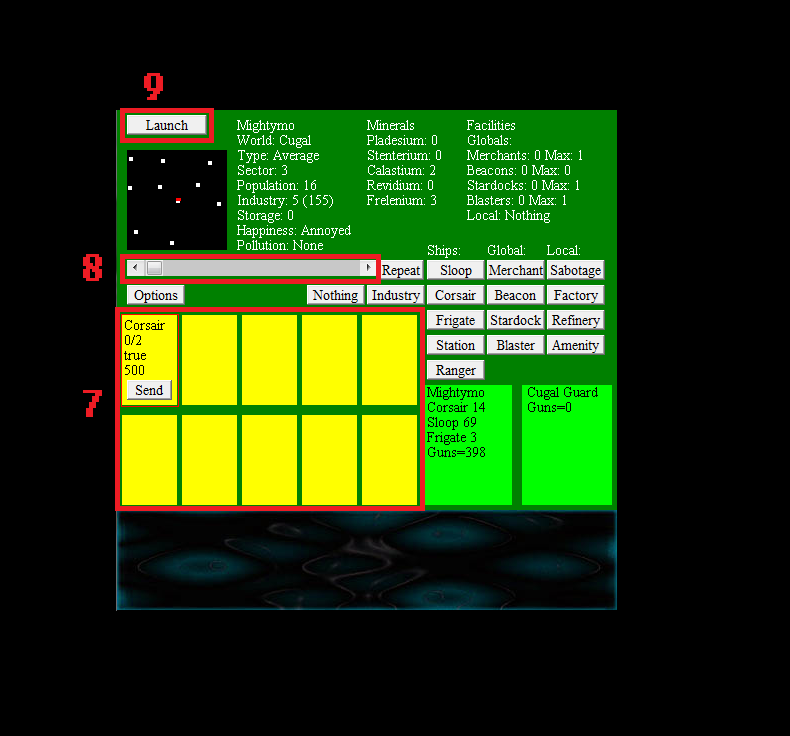 This tells you your world and dart count, your score, which tells you how close you are to winning, as well as your channel and coordinates. The channel is the chat channel that you’re in; only people in the same channel will be able to hear your chat. Slightly below this is your fleet information (4). This shows how many of each ship you have in your fleet. The green navigational diamond will point you towards the center of the galaxy (5). You can move by clicking on a planet, you will battle the planet if you try to land on it without owning it. Once you enter battle with a planet, you will come to this screen to battle with the guarding fleet. You can see you own fleet (1) as well as the enemy fleet (2). At the top you can see the overall information of both fleets (3). You can see the total guns as well as the ECM. ECM is a bonus applied to all ships; it is supplied by stations, rangers, and Star Darts. 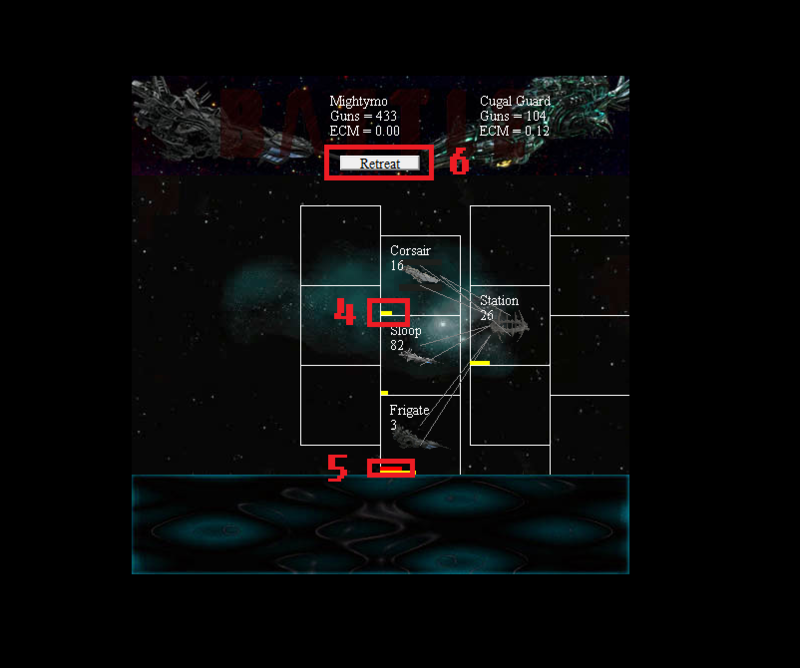 By clicking and dragging from your ships to the enemy’s, you can set their targets in order to attack. Squads show their current targets with gray arrows. 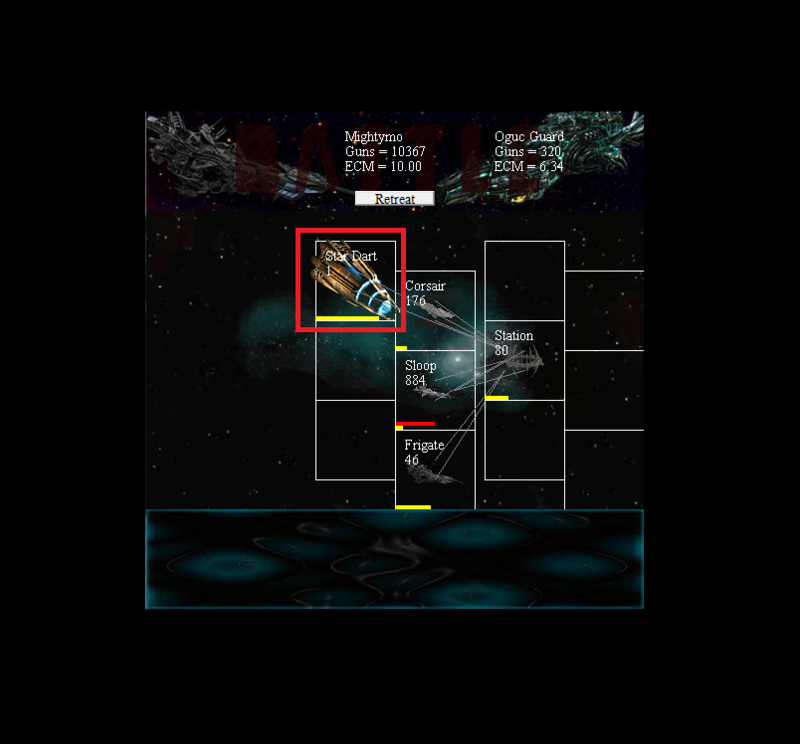 The timer until the time that the ship will make its next attack is shown by the yellow bar (4). 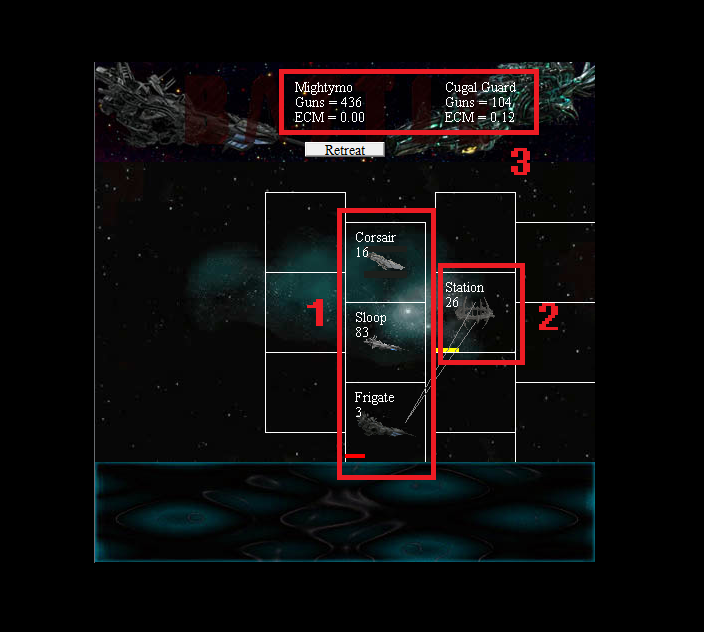 After a ship has been hit it will take damage, shown by the red bar (5). Once the bar goes all the way across the box, the squad will lose a ship. If you don’t feel confident about the battle you can retreat by clicking the retreat button (6). Be warned though, you can only escape as fast as your slowest ship! Pollution is created when you build too much industry. Be careful, if you your pollution is too severe, the population may rebel and destroy your industry! There are also four types of local facilities. You can only have one per planet and is effect works only on that planet. The buttons bellow (6) allow you to build these by using them while having a build slot selected. 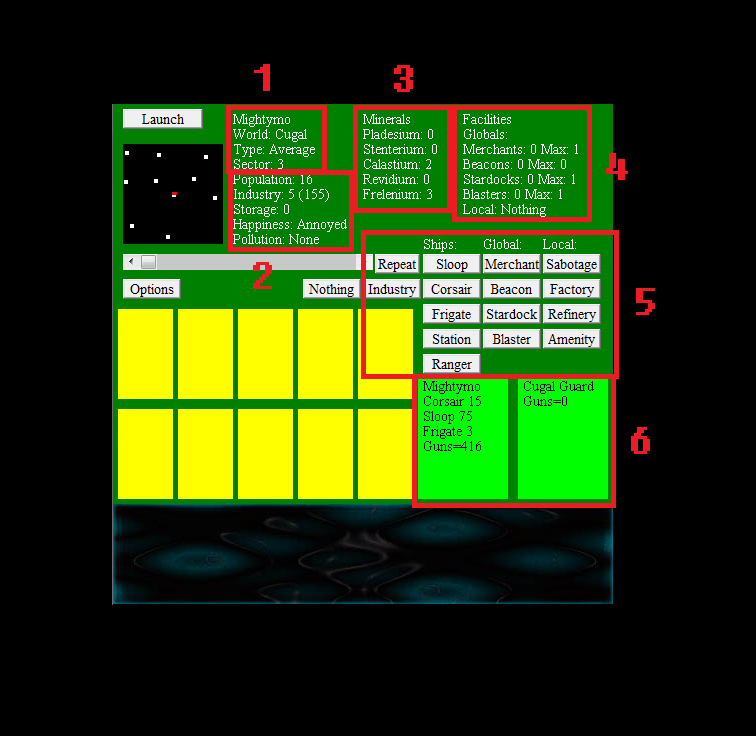 The yellow boxes are build slots that allow you to build ships and facilities (7). To begin, click a box. Then then choose a ship type or facility. In the build slot you will see the selection that you have made. At the top will be the name, after that comes two numbers. The first is how many have been built, and the second is the amount to build. This number can be adjusted with the slider bar above (8). The next part is the repeat, if set to true the build will go to the end of the queue when it is finished. This can be set by clicking the repeat button. Finally, the cost is at the bottom. The higher this number, the longer it takes to build one of the type. If your planet does not produce enough build points to reach this number, they are put into storage. Once your storage reaches the cost, the ship or facility will be built. 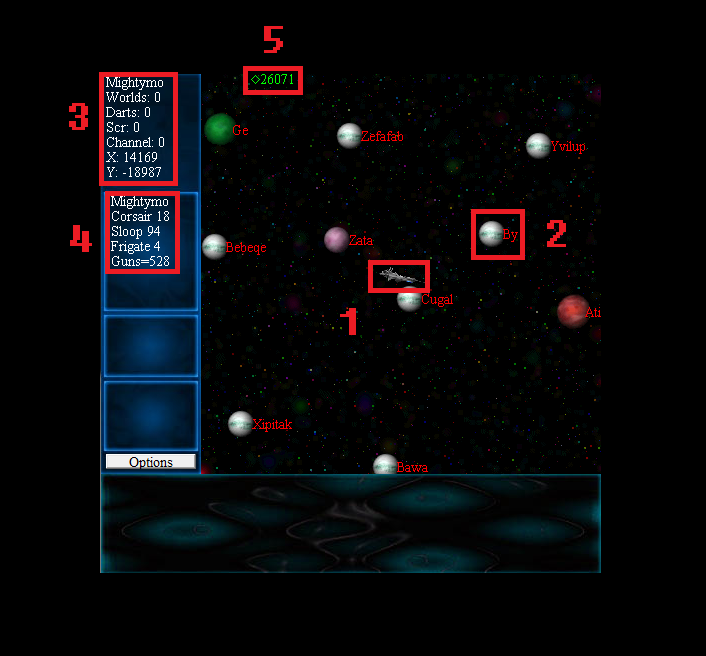 Once you are finished, you can press launch (9) to take off to continue conquering the galaxy. After much traveling throughout the galaxy, you may find yourself near the galaxy’s core. Here, planets are much stronger and provide greater industry to those who conquer them. At the center are the core worlds and Old Earth (1), the most powerful planet in the galaxy. You can always find you way back however; the pink navigational diamond always leads you back to your last planet (2). Across the galaxy are phenomena such as gateways (3). These will take you through them to another gateway somewhere in the galaxy. Everything that you get, from planets to darts, will give you points. 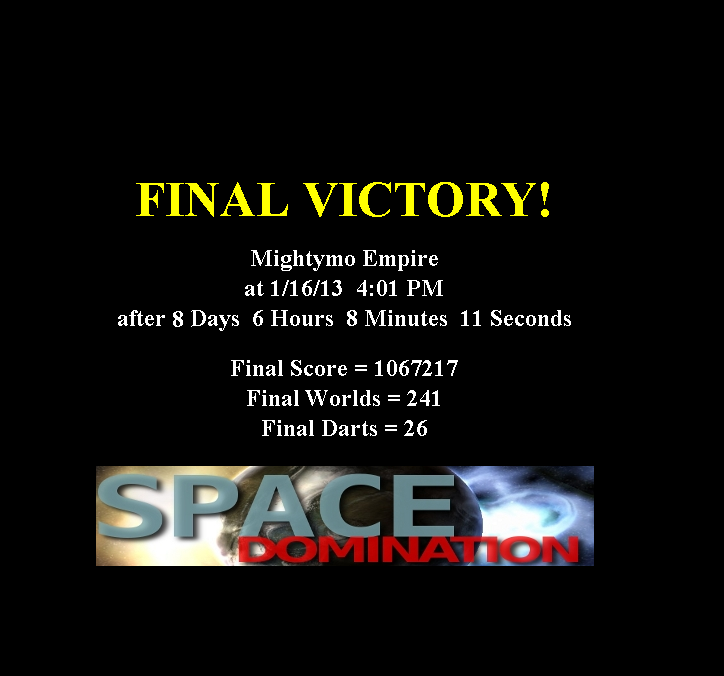 If you manage to get enough points, you will win the game and go down in history as an immortal victor of the galaxy!